The "Run for the Roses" is a modern sport hidden in tradition. Between the hats and the singing of “My Old Kentucky Home,” the Kentucky Derby has retained a sort of timeless quality. However, it continues to be changed by technological advances in robotics, medicine, and artificial intelligence. Some of the technological changes from the 1940s have had phenomenal impacts on the sport, from determining the winner to the genetics of the horses racing in the 2017 Kentucky Derby. Despite the traditions and pomp of the race for the roses, it’s an event that’s been changed irrevocably by technology. The Kentucky Derby race is scheduled to start at 6:46 p.m. in Louisville, Kentucky, which is in the Eastern time zone. The call for “Riders up!” is at 6:31 p.m. and Kentucky Derby official begins with the national anthem at 5:08 p.m., sung by Harry Connick, Jr.
It’s hard to imagine the start of the Kentucky Derby without the moment when all of the horses have been loaded into their post positions, and then they all spring forward as a bell rings and the doors spring open. But that moment wouldn’t be possible without a jockey named Clay Puett, who invented the first closed-door automatic starting gate in 1939. Before that, races started with horses standing in front of a rope, and false starts were incredibly common. Without the automatic gate, the fastest two-minutes in sports would likely need a few tries before getting underway. 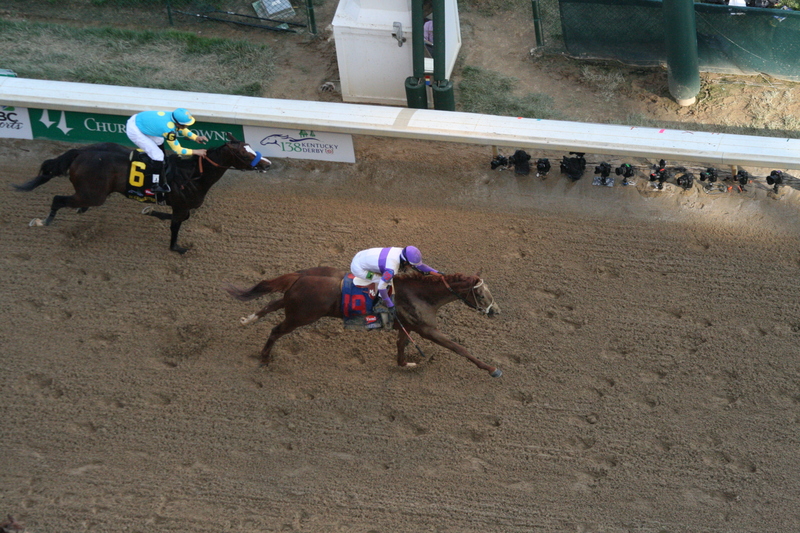 On the 138th running of The Kentucky Derby, "I'll Have Another" won by a length at the photo finish, the cameras are visible along the bottom of the white rail on the right. There used to be a judge standing at the finish line of the Kentucky Derby to determine who won the race. And after the camera became popular, there was a trip-wire strung across to take a series of photos of the finish. Because of the way shutters worked, horses on the outside would appear to be ahead, so a whole system of lights and a vertical camera shutter was invented. Today, we don’t have to deal with setting up triple-mercury lamps to make sure horses are illuminated enough to get accurate photo-finishes. Today, we have motion-sensitive digital cameras in excess. Big Brown rolled into the Belmont Stakes in 2008 riding high on a series of races powered by a steroid called Winstrol. The Belmont Stakes was his big run without steroids. He finished dead last. Since then, drug testing has become even more sensitive in order to catch doped horses, and all trainers, vets, and workers have to log in and out of the stables. Although it won’t affect the 2017 Derby, at the end of April the anti-doping agency used for testing Olympians was invited to test horses across the sport in the future. It used to be that interfering with a horse before the Kentucky Derby just required slipping past the security guards posted outside the barns. Then you could go about your business of trying to slow down a rival horse by sticking sponges deep in its nose. This cuts off a large portion of the air intake of a horse (but still lets it breathe and act normal when it’s not galloping at full speed), and has been a problem in racing almost since its inception. These days, Churchill Downs has video surveillance of every stall, in every barn. So if a would-be sponger is someplace they’re not supposed to be, someone knows immediately. Races in England are often on grass surfaces, where races in the US are usually on dirt. Synthetic tracks are growing in popularity in the rest of the world. After the public deaths of Eight Belles and Barbaro in 2008, synthetic tracks designed to be easier on horses exploded across racing. And while horse deaths went down, synthetic tracks punish horses with early speed, and change how horses move when they run. This means horses who trained on synthetic tracks will often fail on dirt, or have unpredictable races. For the Derby, this means that it is hard to determine how horses will perform on the Kentucky clay surface at Churchill Downs if they normally run on synthetic tracks. Today, most tracks in the U.S. are dirt, but outside the U.S., synthetic tracks have grown in prevalence. So if you’re betting on the Derby, checking out whether the tracks your favorite succeeds on are dirt or synthetic could be a game-changer for predicting how it could run at Churchill Downs. Today, Churchill Downs runs a mechanical horse hoof robot that hits the ground at 1,000 pounds of force at 70 miles an hour across the entire track. The device that attaches to the back of a van also uses radar to examine the track several feet below the surface. The insane sounding machine was the brainchild of Mick Peterson, an engineering professor at the University of Maine, who build a robot that imitated a horse’s stride and used radar to test the surface of a racetrack in his garage. He discovered that the different layers on a track, up to a foot under the surface, have a dramatic impact on how horses can run and when they get injured. Since 2009, the invention has been used at Churchill Downs to increase the safety of the horses, so we see fewer injuries, and make the race surface standard for the entire field. Lasix, a diuretic that reduces pressure on a horse’s lungs, is one of the few medications that is permitted in a horse’s system on race day. It is also one of the few medications that nearly every horse standing in the start box is almost guaranteed to have taken. Not only does it help with breathing, but the medication flushes a horse’s system before a race, making it lighter on its feet. Northern Dancer, one of the premier Thoroughbred studs today, won the Kentucky in 1964. An investigation in 2014 suggests his success was likely due to Lasix, ten years before the drug was permitted in racing. His success as a stud was largely tied to his phenomenal performance in the 1964 Derby. Every single horse running in the 2017 Kentucky Derby is a descendant of Northern Dancer. Last year, an artificial intelligence algorithm created by Unanimous A.I. correctly predicted the superfecta results for the Kentucky Derby, or the first four placings in order. The A.I. is using algorithms to interpret the bets of the masses to figure out what the most likely scenarios actually are. It’s announced its prediction for the 2017 Kentucky Derby superfecta, and if it guesses correctly it could indicate the beginning of an entirely new era of handicapping.